Most if not all of my previous Dark Angels work centered around Deathwing. This time though, I'm going to look at how to paint the power armoured troops in a Dark Angels force. Getting a nice, dark green doesn't have to be hard to do. This is a very quick process but requires a steady hand in the later stages of the model. I painted this guy up in no time at all and if I hadn't stopped to snap pics along the way, he would have gone even quicker. The freehand work added some time, but that's easily shortened with the use of decals. Expanding this out to a squad of models would be no problem at all. This really is the biggest part of the model. I've never painted a "green" power armoured troop before, but this is definitely a workable method. I'd say that this technique would easily translate over to painting Salamander Space Marines with no trouble at all. Step 1: I started by priming him black. Nothing fancy, just a quick coat of flat black making sure to get all the surfaces. Let this dry completely. Step 2: Over that goes my base color. In this case, I tried painting the model using a zenithal type approach. The reason I was able to do it with spray paint was two reasons. First, the transition in values (light to dark) between black and green is not too much so the blending works well. If I were trying to go from black to say light grey, the range of vales I would have to transition through would be too much and the spray paint would not be able to make that transition very smooth... you'd see the tiny paint specs on the model. Second, I found a shade of green that was perfect for this. It was slightly brighter than what I wanted in the end so I could selectively shade it to create my shadows and end up with a color that was very close to what I imagined in my head. It is the cheapest stuff I could find at Walmart. It also happened to be a gloss spray paint, but that didn't matter since I was going to be washing the whole model anyway and that would take care of the gloss effect. Step 3: After my basecoat dried, I gave the whole model a wash with the old Thraka Green (Biel-Tan Green). This darkened it down overall and killed the gloss effect of my spray paint. Step 4: With my green wash dry, I went over the deepest recesses of the model with a Nuln Oil wash. I was careful not to get the black on the surfaces of the armour and cleaned up any stray marks with a damp brush before the wash dried. This gave me the contrast I wanted. The whole basecoat process is insanely fast. It actually takes longer waiting for the washes to dry then it does anything else. After you get the basecoat down, the rest is detail. Things like purity seals and such can be painted you your liking. I opted to go with the traditional scheme and tried to include as much red as I could in order to see if the overall scheme would hold up or fall to the dreaded "Christmas tree" look. I think it holds up pretty well in the end. I'll say that this guy has none of the fancy weathering or powders either. Even though I absolutely love adding them my models, I wanted to see how this guy would look without the benefit of those techniques (and they can really bring a model to life). Here's a quick look at how I painted some of the other aspects on my model. 1. Metallic areas. I either left them black and gave them a slight drybrush with GW Leadbelcher or painted them the standard route of Leadbelcher followed with a wash of Nuln Oil. I did cheat a little bit and gave the whole model a quick and very light drybrush of GW Leadbelcher at the end. Giving the model a super light drybrush gives the armour a worn look and ties everything together. 2. The chest eagle was basecoated with GW Baneblade Brown, washed with Agrax Earthshade and then highlighted with GW Ushabti Bone. 3. The base. This is done to your match your own theme. I kept it a little more muted here with a rich, warm tone around the outer edge for contrast. 4. The red areas. They started off as GW Mephiston Red. Over that went a wash of Carroburg Crimson and then two passes with Agrax Earthshade in the recessed areas. In order to add some vibrancy to the red, I went in and highlighted the upper surface areas with Army Painter Pure Red. It's a gorgeous, bright red that is fairly transparent which makes it perfect for blending. 5. This is the same as number one. I either left them black and gave them a slight drybrush with GW Leadbelcher in the very end or painted them the standard route of Leadbelcher followed with a wash of Nuln Oil. Sure the basecoat is quick and the other details like the gun and chest eagle are there, but it's the extras you add to the model that really bring it to life. In this case, I went with some freehand. You could use decals and get the same effect if not a better one because of their sharpness and overall consistency. I opted from freehand here for the fun of it and I enjoy the challenge. That and there is something slightly organic about freehand work on a model that I enjoy seeing. I'm going to call this one a win. Because of the speed at which a model or even a squad could be finished and the fact that I was able to avoid the Christmas tree look, I think this one is worth keeping. I was worried at first that the green would not transition well into the black, but after a wash of Biel-Tan, my worries were gone. This is the same thing I do with painting Ultramarines... all I did was go from blue to green. While this method is very quick and gets some nice results, you'll need a steady hand for painting once you get your basecoat down and complete. As you add your extra details on the model, you want to be careful not to get any stray marks on your armour. Since the color is made up two blended spray paints and two washes on top of that, it will be near impossible to match it if you had to fix a mistake. It's just something you need to keep in mind if you choose this method. It shouldn't keep you from ever trying it, just know that this route leaves little room for error in the later stages. When it comes to speed though, it can't be beat. I think it *does* still look a bit "Christmas Tree", but only because the red is quite bright. A darker black-red with extreme red highlights would look even better I think. However, the green is a 100% solid win. Green enough, but not too bright or overdone. Long time fan, first time commenter. 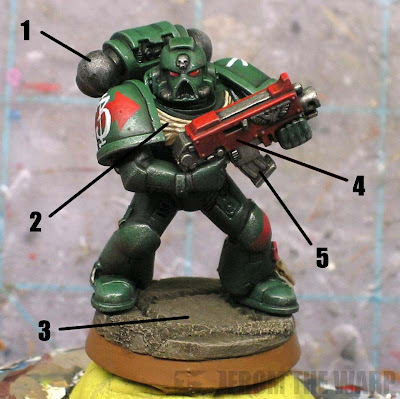 As I'm about to start a Dark Angels army due to the sweet starter set that is Dark Vengeance, I feel this little tutorial could not have come at a better time. 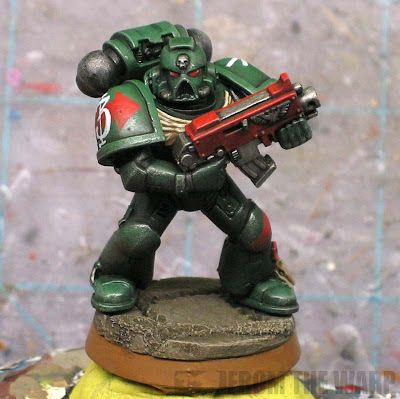 I do feel however that the green shade of the armour is a tad on the bright side, almost Salamanders-like, and I wonder if that would be rectified if you had used a slightly darker green basecoat? 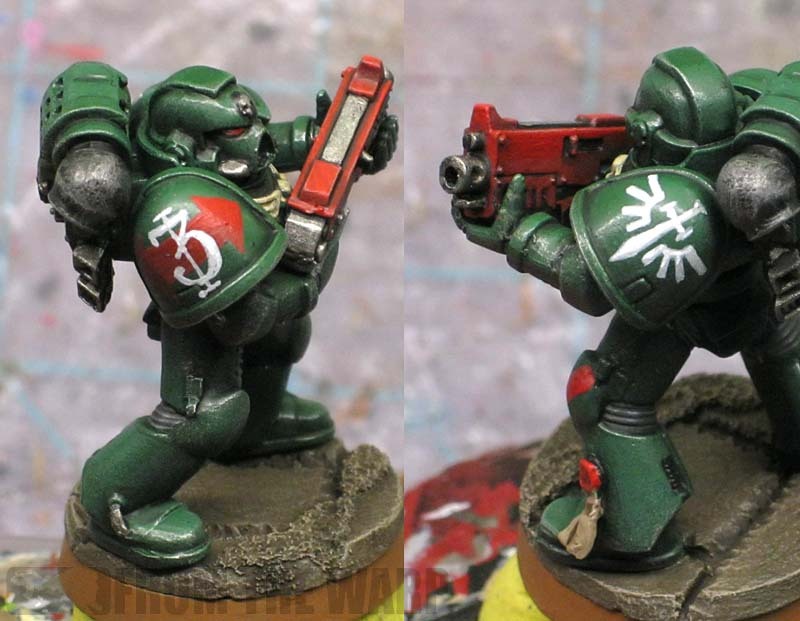 Either way, as you said, the devil is in the details, and the free-handing of the Dark Angels symbol and the 3rd Company markings is what truly gives it away as a Dark Angel. One more question: Would you alter the process in any way if you were to paint a robed Dark Angel? Gilbear: What! You kill me... I see what you mean though. Maybe a muted highlight instead of the bright red highlight would help. I just like the bright red so much though. SteamPoweredTemplar: Excellent, hopefully this helps then. As for your questions, this color green basecoat is what I found on the shelf in the store. The trick to darkening it would be to do another wash of Biel-Tan Green or maybe an overall slightly thinned wash of Nuln Oil to darken it down. You could go as dark as you wanted that way. When it comes to robes, it would depend on how much of the model was covered up. If the majority of the model were in robes, then yes, I would use a different approach. I would switch to a light grey prime to make the robes easier to paint and fit the armour in around that. If there was only one small tabard or something similar, I'd stay with this method. Ron, I'm not a huge fan. The red is too bright, and for that matter, it's Dark Angels, so is the green! Army Painter German Armour (Grey), green ink, and either Nuln Oil or a very dark blue wash into the lowest places would, I think, net you a much better Dark Angels result. The reason I suggest a very dark blue wash is that it'll add more depth of colour to it than the black will, while darkening it up nicely. Love it. Might have to try this method with my Relictors (with Tamiya German Grey Spray and some black wash). ah, thank you so much. I have not been able to figure out how to paint my tact marines. I've got the DW and RW nailed down, but I have 40 marines still sitting in their black primer coat because I have yet to find an method that works for me. I'm going to try something like you, but with the help of my airbrush. airbrush from the top only for highlighting: a mix of Caliban green and one shade lighter. Biel tan wash and then Nuln oil in the deepest recesses. That's really nice. Though, shame on you for waiting for washed to dry;) Invest in a small/cheap travel sized hair drier and those washes and glazes will be dry when you tell them to be dry! Faolan (Jake): I like the idea of the blue wash. That might make for a very nice effect. I'm sticking to my guns with the bright red though... there's something about it for me. Maybe it's the contrast against the rest of the model. Ninjasuperspy: I'm sure you could apply this approach to any number of schemes. Moronic Nonsense: Sounds like an excellent plan! And I bet the use of an airbrush would make the blending even smoother. Zab: I have one, but I don't like to use it. I prefer them to dry at their own pace. It seems like when I do use a hairdryer, it affects the way the they look in the end. I believe this particular shade of green would fit perfectly for the Disciples of Caliban chapter, it tights perfectly with black e.g. DoC colors. I dont think it looks "Christmas tree" like at all. I'll definitely be giving it a try when I finally get my hands on the new starter kit. Excellent work. I like the procedures, style, overall shading and wear and tear very much, but for me the green is too bright. He's almost a Salamander! I remember that the DA gamer and hobbyist Owen Rees (latterly of GW) used a mix of black and DA green for his first base colour. This resulted in something that was dark enough not to buzz with the red squad iconography, bolter casing if using red, to cause the 'christmas tree' effect. ... Just to add that Dark Angels should be dark. Ron, glad to hear you like the blue wash idea. Lately I've been pushing myself to move outside the "normal" of using black washes and the like except in rare times. I find myself doing things like using blue or purples to shade dark areas on things like green and red, and it works a treat to really show contrasts, especially with the purple and red (such a warm colour with such a cold shadowing can give really amazing effects). That's all come about from my not using black to paint black - I've been resorting to using Heavy Charcoal or P3's Coal Black as a base and working from there depending what kind of black effect I want. I do like how your Aquila came out, I may steal that just for something different from my normal P3 Underbelly Blue/Vallejo Ivory combination. Ron, while you're reading my wall of text, I want to bounce an idea off of you: for a chaplain (who's black) in a robe (which by all right should be black as well), what do you think of Heavy Charcoal for the armour, washed down a bit deeper, and Coal Black for the robe, which has more of a blue-green tinge to it, for the soft fabric contrast? You aren't wrong about the hair dryer. They come out blotchy and weird. However, when I spray my finished product with a sealant it seems to level everything out. Though if you use powders a lot I would stay away from sealants as they cut down the effect of the powders quite a bit (but you already knew that from your earlier posts). I shared this post with my FLGS who reserved and sold me my copy of Dark Vengeance, hope it gives you a bump in traffic to curious new owners of the starter set! Ron, I'm a huge fan of yours but I'm not sold on the green. It's too bright for Dark Angels and maybe the wrong shade? I love your Deathwing bone scheme and your recipe for painting black. Maybe re-visit the green and you'll be three-for-three! Psish: I completely forgot about them. Kevin: Let me know how it works out for you. I'd be interested in seeing your results. Isiah: Darker is doable. I guess the trick then becomes darkening it without making it go flat. Faolan (Jake): Models that have more than one kind of black on them can be tough. It sounds like you have a good solution there. I'm not sure how the exact colors look that you listed, but I know the P3 Coal is a cool black. Pair that up against a warm black for the armour and you should be fine. The subtle differences between the different blacks should look quite nice. Zab: Exactly. I really enjoy the look of (and using) powders and since most of my models are for show, I can indulge myself. Dain Q. Gore: Excellent, thank you Sir! Dugatron: Interesting. Do you think it should be warmer or cooler? The consensus so far is that it is too light overall. I love the intensity of your hue, the purity of your pigment and the transparency of your medium. Please never change. Very nice. Mind sharing the recipe for the base? It looks great. I know what you mean about the red (it's my favourite colour... And also the *other* Angels were my first 40K love many years ago!). I still think it's totally distracting though. I mean, the red is the first thing that draws your eye, whereas it should be the head/chest area really. I do like the green though as it isn't too warm/yellow/sickly. However, if you fancy doing a second test, I'd certainly be interested in seeing what a darker green looks like! Klumsee the goblin: The red stays. Anon: The base is done with P# Thornwood Green washed with GW Agrax Earthshade. Then it's given a light drybrush of the Thornwood Green for the first pass and the second pass is the same green with a little bit of GW Ushabti Bone added to it. The base is rimmed with the old GW Calthan Brown. Gilbear: The red does jump out... I may try another test model to see how it goes if for no other reason than I might try to make him as grim and dark as possible to go to the extreme. Considering the fact I've been thinking about Dark Angels for a while... you, sir, are my new hero. Keep up the excellent work. Psish: Good question. When it comes to spray paint, I'm not sure. I haven't scaled the technique up to models that are those sizes. I suspect the dreadnought would be no trouble at all, but the vehicle might have some issues seeing that it is nothing more than a giant box and there is not much along the way of surface variety. I'm going to use this technique for my tau Ron, thanks for taking a bash at it, I have a dark forest green by plasticote spray paint (the British version of krylon) but have been reluctant to use it with it being a gloss but now you have put ny mind at rest :-). As for the dark angel I think it looks spot on. The only thing I'd do different is I would have used scab red (yes I'm still using the old paints) instead of the bright red you used but that's only a personal preference if mine, at the end of the day its your model so if that's the shade of red that you like then that's the shade of red you should use on the model if you ask me. Oh and about the Christmas tree issue...............you're safe. james: Thanks! I too thought the gloss paint might be an issue, but I'm lazy and I figured I could fix it anyway. Turns out a good wash over the whole model does just that... flat as can be. Really nice tutorial Ron. I think the colours are perfect both red and green but I think that may be a generational thing as it looks just how I remember them from 2nd/3rd edition before they were made quite as dark and gothic.